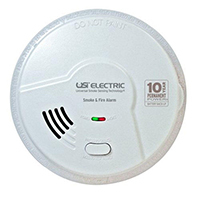 The MI106S 2-in-1 Smoke and Fire Alarm from Universal Security Instruments features patented Universal Smoke Sensing Technology that works to quickly detect and protects against both slow smoldering and fast flaming fires. This device utilizes an both ionization and photoelectric alarms while essentially eliminating nuisance alarms. It also features a sensitivity adjustment when changes in humidity and temperature occur, as well as a self-diagnostics check. It is ideal for both replacement and new installations. This 120V AC hardwired alarm is great for use in apartments, houses, and mobile homes. The back-up battery is tamper-proof, providing comfort even during a power outage. This cuts down on environmental waste from batteries landing in the trash. The mounting base covers easily hides drywall imperfections and has the option to to replace retrofits.